Use at your own risk im not responsible for any bricked devices. If you where brave enough to test, please share your experience. How did you effect this? Is this built on NA region FW or EU region FW? Thanks for sharing...I Might give this a go if this is on NA FW. In the Source there are two folders. One for the romfs and one for vendor specific files. replaced every file in both folders with the files from 1.04. Run a make romfs and make image to get the bin. Awesome, I'll give this a go...What did you change to effect the 2Mb Uplink cap? Curious, would you be able to do this for the DIR-827 and 657 maybe? I just changed the script that initializes the QoS Engine and the QoS Webpage to allow higher Upload. I guess that should be possible also for other devices. But first this needs good testing if there is any negative impact. Please also report how it is working for you. Ok, will give this a go this weekend and see. What code is exactly changed. Please feel free to post. Thanks for doing this and sharing. I'll recommend that users seeing this be aware that this is not a official release of FW and is not supported by D-Link and may invalidate any warranties users may have on the router. This is a un-supported modification. If users choose to try this, please use the FW Update Process. It is the same change as i did on the 1.0 firmware. the thread must be somewhere here. # If the detected speed is > 2000000 (2mbps) then we disable the shaper. and then change the check in the adv_qos.asp. basically the them from 2048 to 20480.
im to lazy to boot the vm up again to post the exact code. Awesome. I think I moved it into the Archives. I know theres a DIR-645 that someone did a mod on as well for L2TP connections. I'll give this a go and report findings as I'm on a 3Mb uplink now with my ISP. Will be playing xbox tonite with 2 boxes gaming. Will see how it works. I have 5Mbit Upload and set the Upload Speed for QoS to 5120. On speedtests i get around ~ 4,8 Mbit. Seems fine for me. Some upload gets lost by overhead and maybe the qos engine is also limiting it further to have some headroom. I know from other QoS Setup that Upload limit should be set to ~90 % of the total upload speed. Maybe the engine is doind that internally dunno. I think your are on cable right? As you said it can be possible that on peak hours that you dont get your maxiumum speeds, cause cable is shared medium. anyways for my quick test its running fine. lets see how it goes. So checking again this morning, I'm still seeing the sustained uplink test kick down from 3Mb to 2.5Mb shortly before the test ends. I don't notice this on a different router thats has a DIR-645 class Traffic Shaper that supports over 2Mb speeds. So I presume the TS is doing this. I do need to test with my PC out of the QOS rule I have setup. Over all it working good though. We played Ghosts for hours last night and didn't see any issues while both xboxes were online. OPEN NAT. Gaming was good. Try with only automatic classification. for me it its going slowly from 0 to 4.8 MBits. And i have no drops on end of the test. which test did you use? Does your ISP use some kind of bursting for upload? Ok will try when I get home. No on isp processing. 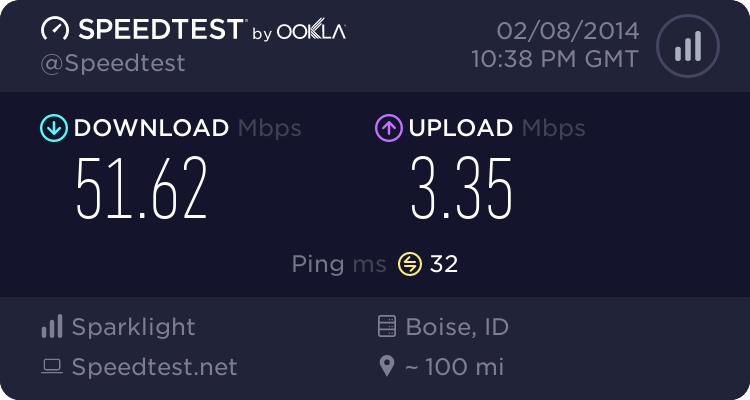 Mines thru the isp ao it does there own test then they automatically connect to speedtest.net and run a test there. Ill go back and run my own w speedtest.net and see. can you do some heavy uploading (ftp transfer or upload test) and check your latency at the same time? With QoS enabled and without to compare them? You assigned your pc a qos rule? so every traffic gets the same priority? i think this is same kind of suboptimal. maybe you should assign qos rules on port basis rather then ip basis.